One of the best ways to encourage kids to eat healthy food is through tasty dishes that are presented in fun and appetizing manner. A plain bowl of oatmeal can be made more appetizing by adding banana for eyes, nuts for nose, and honey for a sweet smile. For our back to school breakfast, we gave the good old buttered toast a new and more enticing look with the use of a waffle maker. 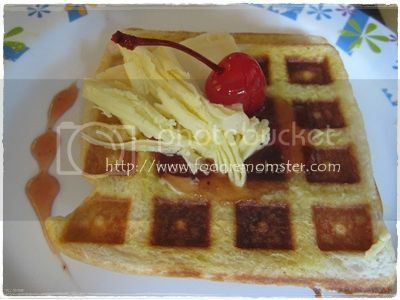 Here are 3 easy steps to make Bread Waffle, our quick and fun breakfast that is perfect for the morning rush. Get a piece of sliced bread and spread butter on both sides. Heat waffle maker and put buttered bread on it. Leave for 1-2 minutes until it turns golden brown. Serve with cheese and/or fresh fruits and jam.